The Kodi Media Center has developed something of a reputation as a platform for pirated content. Although the Kodi Foundation has tried to distance itself from this, it seems other measures are having an effect. The anti-piracy coalition, Alliance for Creativity and Entertainment (ACE), along with new anti-piracy rules in the EU and UK, plus bans on Kodi boxes being sold via online marketplaces, has seen interest in Kodi decline sharply. 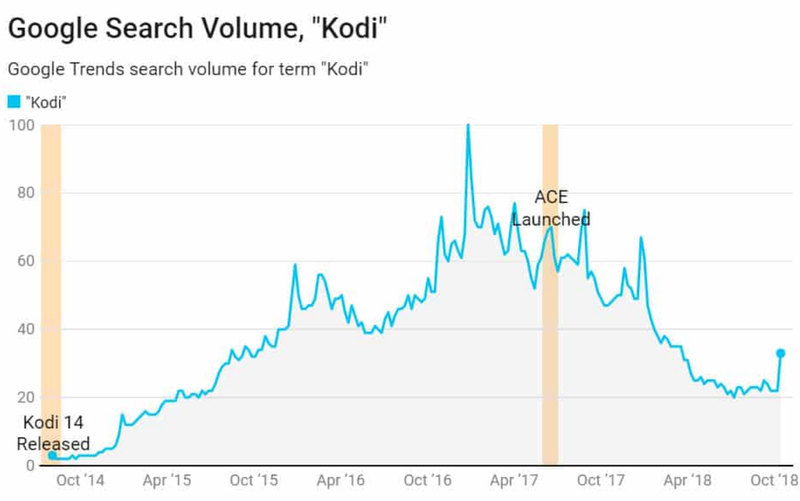 New research from technology site Comparitech analyzing Google Trends data shows that interest in 'Kodi' as a search term has fallen over 80 percent from 2017 to 2018. There are a number of factors that may have contributed to this. Google has removed 'Kodi' from autocomplete searches, plus the Dish Network launched lawsuits against one of the biggest names in Kodi's piracy scene at the time, TVADDONS.ag, and a popular (at the time) third-party addon, ZemTV. The ban on Kodi boxes -- Android devices pre-loaded with Kodi software -- on Amazon, eBay and Facebook also looks likely to have had an impact. Then there are new laws. In April 2017, the EU passed a new law that made it illegal to sell media devices that easily enabled multimedia piracy, the ruling also made it illegal to stream copyrighted material from unofficial sources. And in the UK, the Digital Economy Act 2017 passed into law in late April. Among other things, this law makes it illegal to stream copyrighted content from illegal sources. Since the launch of ACE many third-party developers have quit the Kodi scene in order to avoid facing legal action. Also a number of sites for downloading add-ons including SuperRepo, Colossus, and Simply Caz, have been shut down. All of this looks to have brought an end to Kodi's rapid expansion, though the Foundation's recent updates to add Digital Rights Management show that it is making efforts to be seen as a credible player that is willing to work with copyright holders. You can read more about the research on the Comparitech website.